Mystic Arcana: Sisters Grimm, Act 1, Scene 1. Posted by Watcher (Nico). If her parents were going to be at this festivity, it was the last place Nico Minoru wanted to be. Certainly some kids hated to be at parties with family because their parents were boring. Or worse, embarrassing at parties with friends. Nico had to worry about being a time traveling sorceress who killed her parents in the future because they were part of the most powerful crime ring on the West Coast. And that's why she was in this room of Castle Doomstadt. Not the one she was staying in, but Magik's room. The teleporting mutant demon queen of Limbo had invited Nico for one purpose - she could teleport through time as well. If Dr. 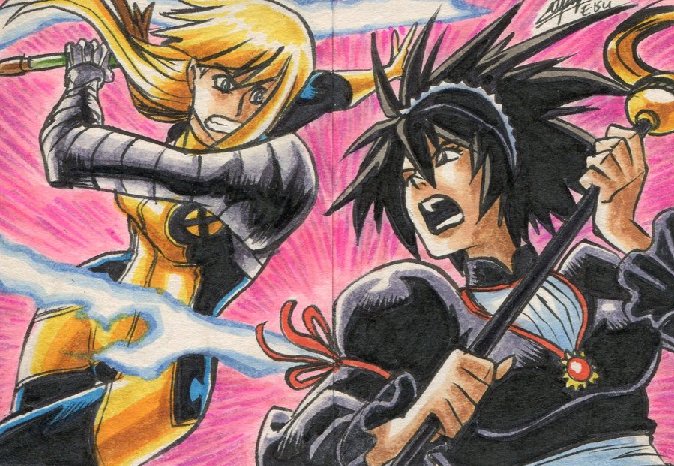 Strange couldn't help her, but Magik could, Nico was willing to grab that offer. The Runaways needed her and she needed them. "Are you sure you can do this?" Nico asked once, getting the feeling of some old cult classic horror movie gone bad. Scary gothic castle in Eastern Europe with a Russian woman offering her a magic spell. No, how could this possibly go wrong. Nico practically rolled her eyes just thinking about all this. The blond demoness looked at her with cold confidence, perhaps half of it for show given her previous misuses of her own power. "Strange has taught me much about using my powers to travel through time." She didn't know her destination, but unlike most teleporters, that wasn't a problem. She merely had to touch limbo and then she could go anywhere or when - Los Angelos, California, 2012 was as simply as that. The circle of the stepping disk formed around the two teen witches, before it rose up, seemingly transporting them through dimensions to Magik's Limbo. Then just as quickly as they touched down, another stepping disk moved them back, hurtling them across space and time in an instant. Both got quite the eyefull as they looked around however. For all Nico knew, they hadn't even left Limbo. Ilyana was the first to confirm, "Is this what it's supposed to look like?" Nico could confirm one thing - they were in LA. She could tell from the features around them. The buildings were stores she'd been to and the road names were familiar even though she didn't have her license. But this wasn't her LA. Bright and sunny as it was, the destroyed landscape spoke of anything but happiness. Rubble from buildings was strewn across the streets and even the roads themselves were cracked and destroyed. Nico's staff emerged as she bit her tongue inside her mouth to draw blood. "Come on, we're finding out what happened," she said as she took command and began to wonder where the other runaways could be. Scene Distinctions: Ruined Cityscape, Los Angelos? "Wait, wait," she called, hurrying after her companion, "Where are we going? If you don't know what's happened, how do you know where to start?" Nico glanced back at her, but seemed to make a conscious effort to ignore the question. Thinking about the situation seemed a lot more stressful than just running forward. "Okay, fine," Illyana sighed, accepting this minor concession for now, "but at least tell me what I should be preparing for? How do you know there wasn't just an earthquake while you were gone or something?" Nico held an arm out to stop her from moving. Illyana followed Nico's gaze forward to a slender alleyway between two abandoned buildings. As they watched, something large and dark moved through the shadows. It paused a moment, and one large, faintly-glimmering eye opened, focused on them, then closed. The shape dashed away. "Oh." Illyana intoned. She pulled her soul-sword from the air. "Well, then..."
I'm sure Conan can find something to do with that. I intentionally left it vague. Also, I'll add an XP to my meager collection for the soul-sword. The "where" was clear. This was Hollywood. Sunset Boulevard, just a couple blocks from the Walk of Fame. Nico could see the Amoeba Records from here, a store she'd visited a lot, back when her life had been normal. It was mostly intact. However, the dome of the Arclight Theater across the street was cracked like an egg, and a high-rise office building to the east had tumbled across the street like a fallen lamp-post, surrounded by a halo of its own broken glass. The massive banner for the second season of an HBO show wrapped the dead building on which it had hung, like a tourniquet. The CNN Building at Sunset and Cahuenga was still standing, all 14 stories, and from the top they would be able to see the landscape for miles around, just the vantage point needed to wrap their heads around what had happened here. The "when" was confirmed by an unexpected source: The electronic news ticker that wrapped around the building's front lobby was somehow still on. It showed an endless string of what appeared to be nonsense language, but was regularly interrupted by an updating display of the time and date. "4:32 PM - Friday, May 4th, 2012 - This is CNN..." it read, before the clock changed to 4:33 PM, bracketed by other nonsense: "IäIäShubNiggurathYgnaiihYgnaiih..."
It was the very day Nico had left. Friday, May 4th, 2012... Where were the Avengers when you needed them? Getting the top of the building wasn't hard. A strange, pentagram like symbol was painted on the doors to the roof. Looking around, the two saw devastation near and far. Knowing L.A., being familiar with how it was supposed to look, made it harder on Nico. The entire Westside was underwater, the ocean rolling further inward to flood the landscape as far as Beverly Hills. The Hollywood sign was, miraculously, still standing, but the Griffith Observatory that perched upon a hill near it was changed. Its domes were open, telescopes pointed into the northern sky, but in the center the building itself had been cracked in two. But even areas further east, far from the ocean, were flooded. In downtown L.A., the familiar skyscrapers poked out of the watery depths of a placid, black in-land sea. The L.A. River, usually just a mere trickle down the concrete reservoirs where the big chase scene from Terminator 2 had been filmed, was a raging rapid. Strange vegetation hung down from trees overlooking the areas where there was water. Flocks of keening whippoorwills flew overhead. Perhaps most disturbing, a huge pentagram drawn with what seemed to be gallons of mismatched spray-paint encircled the very building on which the sorceresses stood. Far to the west, a small new city, built of something strange-- coral?-- rose from the ocean, right where the Santa Monica pier had previously stood. The "where" and "when" were now established. Now what remained was to figure out the "who" and the "how". This message was last edited by the GM at 19:14, Sun 12 Jan 2014. "Ok, new plan..." she started, before pointing forward with the Staff of One, "We're going to try there. That looks a whole lot less destroyed than here. Maybe we'll get an answer. And plan B, we check out Alex's house." She didn't elaborate on who Alex was, but she certainly didn't want to - the look on her face gave that away - if Magik asked, she might answer. She wasn't even sue yet. She levitated a few inches off the ground, just enough that the walk wouldn't be exhausting, before she continued forward, knowing Magik would have to walk. She didn't really trust the girl's teleportation disks at the moment. Proceeding from the CNN building, west on Sunset, offered few signs of hope. Los Angeles was a dead city. The lack of cars was strange. There were some parked along the road, but fewer than Nico expected. L.A. had been a city that revolved around cars. Perhaps there had been warning, perhaps there had been time for people to flee. The thought was almost comforting. Even more jarring than the lack of cars was the absence of noise. Hollywood was silent. Occasionally, a distant dog barked or a bird sang, cutting through the stillness. It was so quiet they could hear waves rolling on the distant waters. The most bizarre detail was noticeable after walking or levitating around for a while, at first only on the trees that occasionally lined the boulevard. On the western side of every plant-- even on blades of grass-- there was a thin layer of scarlet mold. The same striking color bloomed across puddles, or anywhere else there was standing water. It was eerily beautiful. It wasn't until they wandered past the boundaries of the half-mile wide circle of spray-painted sigil they'd seen from the rooftop that they encountered the first corpses. The bodies looked as if they had died fighting, or running from something. On the west side of the bodies, there grew the same vaneer of scarlet moss. A car was parked in the middle of an intersection. A man and women were inside, both dead. The man had shot the woman, then himself, with a pistol still clutched in his hand. They too were burnished with the bright moss. Many buildings stood open. The hospital, they passed, however, had locked doors. The corpses were thickest around it, sprawled in piles. It looked like a crowd had descended on the place, and many had been trampled. Some of the bodies had been dragged away, off towards Fountain, down an alley. Peering down the alley, they saw the first living things they had encountered here that weren't plants: a pack of dogs, of various breeds, watching them silently from the end of the alley. It was starting to get dark. This message was last edited by the GM at 19:09, Fri 17 Jan 2014. "I don't know if you had any more investigating planned," Illyana said to Nico, "but if you think one of your friends might still be alive, I say we make it to his house as fast as possible. I've seen enough of this place to know I don't want to be out when the sun goes down." I hope you don't mind my putting words in your mouth, Nico. Since you wrote a few lines for Illyana in your intro, I think we're in agreement that, at least for the duration of this side-thread, we should feel comfortable writing a few pieces of back-and-forth dialogue when necessary. As always, if you don't like a line or think it needs to be tweaked, feel free to edit it. This message was last edited by the GM at 21:16, Wed 15 Jan 2014. Hmm, no offense meant, but I think it's ok for setting up a thread (was going based on our previous thread starters when I wrote it), but I'd definitely prefer to play our our dialogue. Plus, not too sure how good I could get Magik's dialogue. I've primarily gotten to see her in AvX and after, and she's a bit more homicidal than her 80s/90s self. "No, he won't be alive." Nico said surprisingly sternly. Even if this world was changed, that had to be one thing that was the same. Even her staff couldn't change it. She knew. She'd tried. But her eyes watched as the shadows grew and the houses they did find were full of corpses, not exactly the place she wanted to stay. 'Zombie Knot' had never been the best spell she'd cast and she'd hate to try that again. "Get to the roof," she said, pointing to a flat topped building. Higher ground was always better, right? "I'll set something up once we're out of the street," she said, lifting off the ground towards the top of the building. "We need s'more shelter" she said as she reached the top, the staff conjuring for them a full campsite. Two sleeping bags, a tent, and a magical flame. They didn't really have food for it, but Nico had gone hungry before. 'Without the rush of cars, the air's a lot nicer for camping on a rooftop' Nico thought, a small silver lining to her slumber party with the other teen witch that was about to go on. No offense taken. I guess sometimes the play-by-post system just feels stifling to me when it comes to dialogue. Not that I would want to write major dialogue for someone else's character or whatever, but sometimes it's frustrating to have a short discussion take multiple days to play out because you can't just have the other person say "What's that?" or "Yes, I understand" or whatever. But it's totally understandable to want to stick to that rule, since the things a PC says are the major source of character development. Previous post edited so I'm not speaking for you. The building was a hotel. They hadn't investigated it much, though, instead proceeding up the back fire escape which was hidden from the street. The roof seemed secure enough, and comfortable enough after Nico had (literally) made camp. Fortunately, the fire was warm but the magical flame was a muted green color, that shed less light than a normal fire would have. Not drawing attention was something for which they were grateful. This building was taller than the CNN high-rise, and they could see more of the devastation to the south and west. There was also a tall antenna here, but lashed onto a smaller one that was connected to the rooftop. It was clear that the taller structure had been placed here, and messily welded to the existing one, jury-rigged to some kind of device hooked up to a row of car batteries as well as an electrical outlet. The device turned out to be an iPod dock, and it looked to Nico like the whole thing was set up to transmit a sound file that the iPod was playing on repeat. Nico had ear-buds, so she just took the iPod out of the dock to listen. "...resistance comes into L.A. monthly to resupply. If you need a rescue, be underground at the Hollywood and Highland Metro subway station on any day that was a U.S. holiday before the Incursions, according to any office calendar printed for the year of the Incursions. We don't use exact dates because we believe they can understand them. If you don't know what day it is, the ticker at the CNN building still displays a correct date, as of this recording. This is a recording. The message will repeat in a few seconds... Attention, humans, superhumans, mutants, Asgardians, and Atlanteans, there is hope. The resistance comes into L.A. monthly to resupply..."
Unfortunately, neither of the two could think of a U.S. holiday around May 4th. Despite what Chase would have said, Nico knew that Star Wars Day ("May the 4th Be With You") didn't count as a real holiday. The thought reminded Nico of her friends, and it was hard not to wonder if they were still alive in this weird version of the present or not. Night fell like someone flipping a switch. The clouds off the ocean seemed to roll in quicker and heavier, dimming the sun, and the air felt more pregnant with moisture than L.A. should be. Random buildings in the distance, perhaps every 1 out of 20, showed signs of still having electricity. But overall, the skylines of buildings far away were much harder to make out after night fell. None of the street lights came on, though the traffic lights at some of the empty intersections were on, and still changed occasionally for no one. Illyana, having no context for what one would make with these particular items, remained entirely mystified. This message was last edited by the GM at 19:08, Fri 17 Jan 2014. As Nico took a stick, she looked to the puzzled girl and ask, "Aren't the X-men basically a summer camp? You guys never had a camp day or something?" Man, Molly would have changed that if she had ended up joining. Great, another memory of her friends. Nico couldn't help but sigh a moment before she began to work, ripping the bag open with her teeth to the marshmallows and then sticking on on the stick to cook. In a few minutes, a golden brown marshmallow was grabbed between a pair of graham cracker halves and a piece of slowly melting chocolate before being handed off to Ilyana. "It's not healthy, but makes hunger one less thing to worry about," before she stuck two more marshmallows on the stick and began to cook, sure they'd have to finish off the bag to get a filling meal out of the snack. "I don't see what Summer Camp has to do with anything," Illyana said, inspecting the confection. "If Sam and Roberto's movies are any indication, that's where drunk, slutty teens go to get murdered by axe-maniacs." Her first bite was accompanied by an impressed noise, before she quickly finished the rest. She then asked for "some more", and was confused yet again as to why Nico seemed to think that was so funny. This message was last edited by the GM at 01:45, Thu 16 Jan 2014. Nico continued to make s'mores, showing Magik how as she did, until their bags were depleted. They still had a few left over graham crackers, but a dozen or so treats had left her decently filled. But once the marshmallow had cleared from her teeth and her tongue found all the remaining bits of crumb and chocolate and picked it clean, Nico tried to offer a bit of explanation for what she had said before. "My friends and I had parents who were all super villains. You know, the crazy dark wizards with the Staff of One that I mentioned at dinner were mine. If we need information, one of their HQs was Alex's house. I figure access to a super computer and possibly finding my friends could help." She didn't finish the sentence how she wanted. Her mind added 'if they're still around,' but now wasn't a time to be letting feelings keep her back. It was a time to do what the Runaways did best - survive. "Good idea," Illyana said with a nod. "I'm a little curious to see how far technology has come since my time, and a little scared. But a 'super-computer', as you put it, should definitely be helpful." There was a lull in conversation. Illyana stared up at the night sky. If there was any good to come out of whatever had happened to this city, the lack of running cars had lightened the famous smog that hung over L.A. There were even a few stars visible, and she squinted to make them out. "Hopefully, it'll be worth it," she continued. "I know it will be hard for you to go to that house." She didn't lower her eyes from the sky, but she assumed that Nico was probably looking at her now. "Every time you mention your friends you look down at the ground," she said, by way of explanation. "And you hold your breath for a few seconds after you finish talking. Especially when this 'Alex' person comes up." Now she did turn to look at Nico, making sure their eyes met in the hopes of seeming supportive instead of accusatory. "I'm not going to pry. If you wanted to tell me, you would. But thank you for doing what you can to get us some help, even though it hurts." "Well, my friends are all missing or maybe lost in time or maybe just stuck without me. But Alex...me and him had a thing. And then he sided with our parents, betrayed the rest of us, and tried to get me to end the world with him." It was something huge to get off her chest. Even after all this time, that stung. "And I was stupid and love struck enough to try bringing him back," she actually let out a laugh that time. "You'd think I'd actually have learned something," she said. It was easy to see, in hind sight, her numerous bad relationship choices. She's quite literally kissed half her team. She laughed again, admitting "Last boyfriend chose a girl 100 years his senior over me." "Relationships are something I don't... have a lot of experience with," Illyana said quietly. Sometimes it embarrassed her when she spent time with 'regular' teenagers. She liked to give off the impression that she just didn't care about romance, which was mostly true, but she couldn't deny that part of her wished she could live a normal life. Regardless of whether or not her relationships had ended in tragedy, talking to this older girl who Illyana felt had lived so much more than she had, she felt a little envious. "There aren't exactly a lot of cute boys in the Otherplace," she said, allowing herself a weak joke, "mostly just... imps and demons and stuff. Losing people you care about though, I have some experience with that." She thought about poor dead Doug. He had only died a few months ago, but she was ashamed to realize that she hadn't thought of him once since her brother disappeared. Some friend she was. "Remind me sometime, after we get back, to tell you about a boy named Doug Ramsey..."
"Count on it," Nico said, though in her mind she wondered if they were going back. This wasn't exactly the time she'd left behind. But when and where was it? No - however Magik traveled, even though she'd gotten it right, she'd gotten it wrong. Even if L.A. had ended up destroyed like this, there wouldn't be a distress beacon telling the Avengers that there was hope - this was something far bigger and would have been something they'd heard about even while in Oklahoma. For now, their plan had to be figure out what had gone wrong. Fix it. And then return and try again some other time. For all her boasting, Nico could tell Magik was like her - a girl with a lot more power, loss, and responsibility than she needed. "We should probably head to bed if we want to try again for the coral city tomorrow. I can keep watch first," she suggested. Maybe they didn't need it, but it seemed the best idea. Illyana slept first. Or tried to. Sleep was seldom easy for her, but this night it eventually came. After a couple hours, there was earthquake. It woke Illyana, but only for a few minutes. The tremors shook the building, but didn't make much noise, and there was a sound like lots of distant glasses clinking against each other, but little came after that but smaller aftershocks. Nico was more used to earthquakes than Illyana, yet even the mutant sorceress, accustomed to the shifting terrain of limbo, was not too fazed. After ten minutes, she fell back to sleep. They changed watches some hours later. Nico rested as Illyana surveyed the shadowy expanse of this strange, desolate city. There were some more aftershocks, but none shook the building too much, and Nico slept through them. Illyana knew L.A. was supposed to be prone to earthquakes, but these seemed constant. To her understanding, the shaking was much more frequent than such temblors had been before whatever cataclysm had befallen this era. Around 4am, Illyana saw something. First there were dark shapes in the street. Then about a half-dozen figures, moving quickly, entered the lobby of the hotel. There were some crashing sounds, and then something entirely unexpected: A strange, slow piano music began to issue from the levels below, barely audible. She could only hear it because the rest of the city was so quiet. Illyana woke Nico and told her what she had seen. Someone was below them, but whether those who had entered the hotel lobby knew the girls were up on the rooftop was not clear. OOC: An unlocked door from the roof leads down into the hotel itself, and maintenance stairs can get you down to any floor as low as the second. If you choose to investigate the lobby, or enter the hotel at all, make sure you specify light sources, as the entire interior of the building will be pitch dark. This message was last edited by the GM at 19:25, Fri 17 Jan 2014. "I didn't get a good enough look to see who, or what, they are," Illyana said. "If we want to escape, my stepping discs will take us as far as we want to go... but we'd be missing an opportunity to start to find out what's going on here." She walked toward the only door she could see and listened to the eerie music rising up from below. Her soulsword appeared in her hand, a beacon of light in the darkness. "I'm not much for sneaking around," she said, craning her neck back to look at Nico again. "I'm used to facing an enemy head on, but we'd be fools to run in there waving our weapons without knowing what we're up against." She thought about what she was going to say next. Illyana Rasputin was not keen on taking orders from anyone, but Nico had proven herself to be smart and resourceful. The whole reason they had come here was for Nico to find her friends, and she knew this city much better than Illyana did, even if the city wasn't exactly itself right now. She stepped back towards Nico and took a deep breath. "This is your mission," Illyana said, "so we'll play it your way. What do you want to do?" This message was last edited by the GM at 15:24, Sat 18 Jan 2014. "I think you're right that it's about time we start getting answers," Nico said, summoning her staff as she woke up. "We figure out who they are and then if we have to, we kick their butts." The solution was a simple one, but this wasn't exactly time to play around. Not that she was all that scared between herself and the mutant with a glowing demon sword. "Let's go as far as the stairs will take us and then we'll decide." This message was last edited by the GM at 22:12, Sat 18 Jan 2014.